I'm starting the year off with a bang and the celebration of a long life! This is a photo of Iris Apfel, a 90-year old (former) interior designer, jewelry designer and noted style icon. 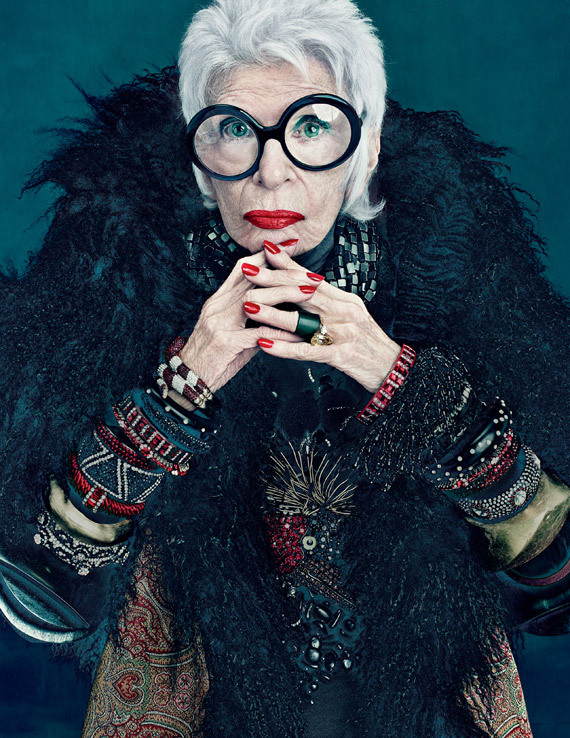 Ms. Apfel has been the subject of quite a few prominent conversations lately (a book, several articles) proving that a full and interesting life doesn't end at any particular age. The internet has been buzzing with her most recent mash up-- a haute cosmetics collabo with MAC. This photo really caught my eye. Striking. Bangles, lips and frames--oh my! Style as we know is timeless...as are red lips and statement jewelry. I die. Honestly, Iris looks just plain gorgeous. The exciting MAC collabo is a 20-piece collection that includes lipsticks, eyeshadows and nail lacquers with names like Scarlet Ibis and Toco Toucan. The line is meant to celebrate her colorful life and style! Go Iris, show us how it is done. The collection arrives in stores beginning in early January. Stay Posh!